DeMar DeRozan scored 37 points and led a Toronto onslaught as the Raptors rolled over the Wizards 130-119 in Game 2 of their first-round series on Tuesday night. John Wall scored a game-high 29 points to go along with 9 assists but got next to no help from his fellow starters. The rest of the starting five combined for 27 only points. Mike Scott, arguably the second best player on the Wizards in this series had a nice game with 20 points on 7-of-10 shooting and 4-of-5 from three-point range and Ty Lawson, playing his first game as a Wizard, added 14 points and 8 assists off the bench. Toronto started the game where they left off from the last one, connecting on their first four field goals and forcing Scott Brooks to burn an early timeout. The timeout didn’t work. The Raptors knocked down seven three-pointers in the opening period en route to a franchise-record 44-point first quarter. Washington started the second quarter connecting on their first six field goals but unfortunately for the Wizards, they couldn’t get any defensive stops. They trailed 76-58 at halftime and if it weren’t for Mike Scott scoring 14 first-half points, it could have been way uglier. Washington got back into the game with a better second half. They trimmed the deficit to 10 at end of the third quarter and even cut the lead to five, 108-103, in the fourth quarter. But as soon as they got within an arm’s reach, Toronto countered with a 17-4 run to pull away and send the Wizards back home down 0-2. Otto Porter knocked down a midrange jumper to start the game as the Wizards took a 2-0 lead. But, that was just about the only thing that went well for the Wizards in a nightmarish first quarter for Washington where they showed just about as much intensity as they would in a mid-January game against the Atlanta Hawks. Washington’s regular season bad habits, mainly on the defensive end, reared their ugly head from the get-go. The Wizards couldn’t get a stop in the first quarter if their life depended on it and lapses occurred in a variety of ways. Toronto had the ball on a string, and that had Washington scrambling and more often than not, creating wide-open three-point attempts for the Raptors. With the Wizards already in a 17-6 hole, John Wall picked up his second foul of the game on an offensive foul where he was out of control driving through the lane at the 7:42 mark of the first quarter. His early foul trouble led Ty Lawson to see his first action as a Wizard. To make matters worse, Bradley Beal picked up his second foul and was forced to go to the bench at the 3:59 mark of the period all but erasing Washington’s hopes in this one not even one quarter into the game. Toronto shot 59 percent from the field and knocked down 7-13 three-point attempts en route to a franchise-high 44-point first quarter. The Wizards trailed by as many as 22 points in a quarter that featured two separate 10-0 runs by the Raptors. John Wall led the Wizards with 29 points and 9 assists with most of his damage coming after halftime as he was sidelined for most of the first half with foul trouble. He was much more aggressive in the second half and again, was not settling for jumpers. He got to the hole and finished and got to the stripe as well, knocking down all 11 free-throw attempts. 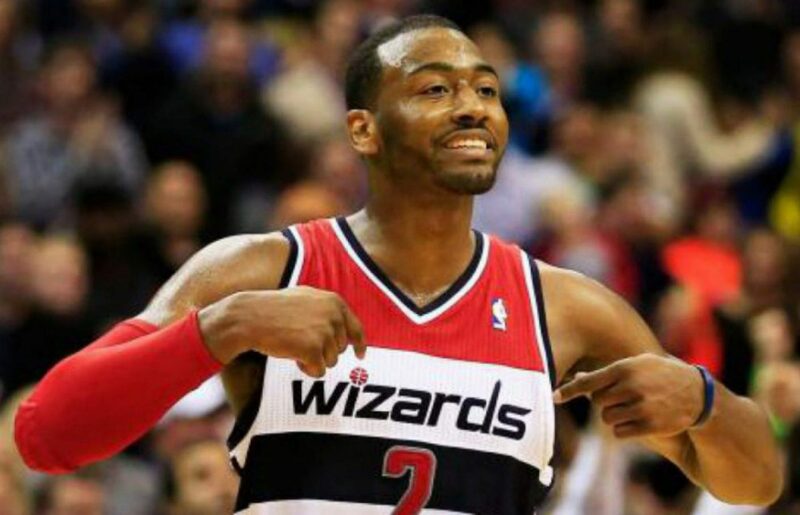 Unfortunately for Wall and the Wizards, he was the only starter who played well. Porter, Morris, Beal, and Gortat combined for 27 points on 32 shots. Morris was -31 on the night and Beal was a -34, the worst plus/minus for a Wizards player in a playoff in 20 years. Ty Lawson scored 14 points and dished out 8 assists in his Wizards debut. His 8 assists are tied for the most by a reserve in the playoffs since the start of last year’s playoffs. He wound up playing the second-most minutes on the night behind Wall. Bradley Beal committed three of his four fouls on Toronto three-point attempts. Just a disastrous all-around game for Beal. Every active player on the Raptors received playing time.